Last updated 05 December 2018 . By Anisah Audu. Who's ready for a season of keeping cosy at winter pop-ups, chowing down on Quality Street and hitting the office parties hard? While December may be the month of Christmas celebrations, it also signals the start of winter and you’re going to need something to keep warm. 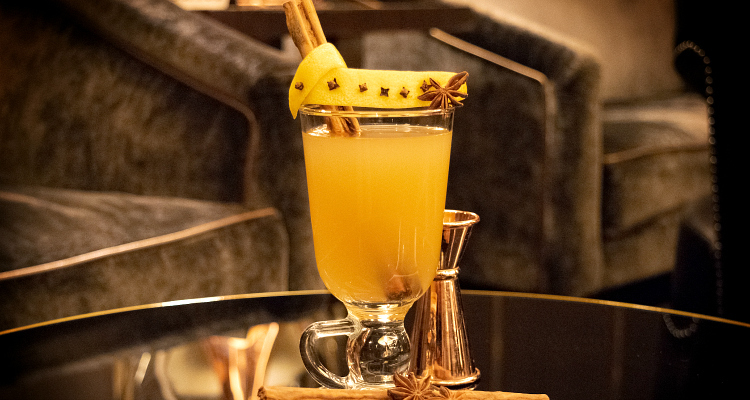 From mulled twists on classic cocktails to old-school eggnog and iconic Irish coffees, we’ve rounded up the best hot toddies in town. So while everyone's cooing over Instagrammable Christmas trees and sparkly Pegasus installations, we'll be holing up these fabulous spots. After taking The States by storm, Miracle has landed in London, with its kitsch holiday décor, costumed bartenders and nostalgic tipples in tow. Born in New York, this merry pop-up is taking over the Henrietta Hotel, bringing you the quirky Snowball Old Fashioned, a cheeky Yippie Ki Yay Mother F*****R and this retro Jingle Balls Nog which combines brown butter fat-washed cognac with Amontillado sherry and all the usual suspects. Christmas has come early at this miraculous pop-up. 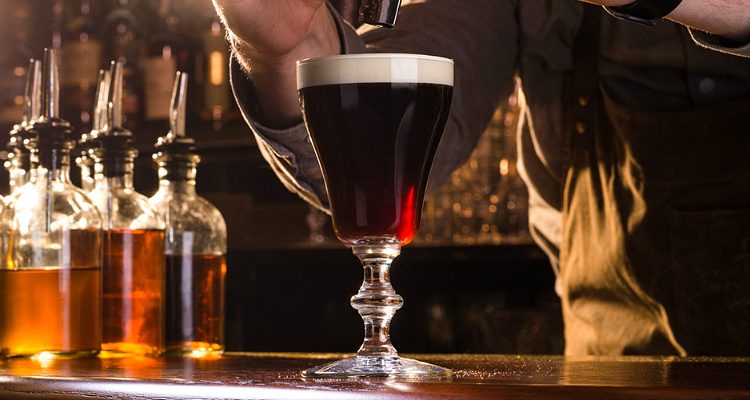 When it comes to Irish Coffee (£10), there’s only one place that you should be thinking about. A glorious choice all year round, Swift’s take on the classic isn’t strictly for winter, but now’s the perfect time for it. A silky smooth combination of Jameson Caskmates and demerara-sweetened filter coffee topped with hand-whipped cream and nutmeg, it’s snow good. 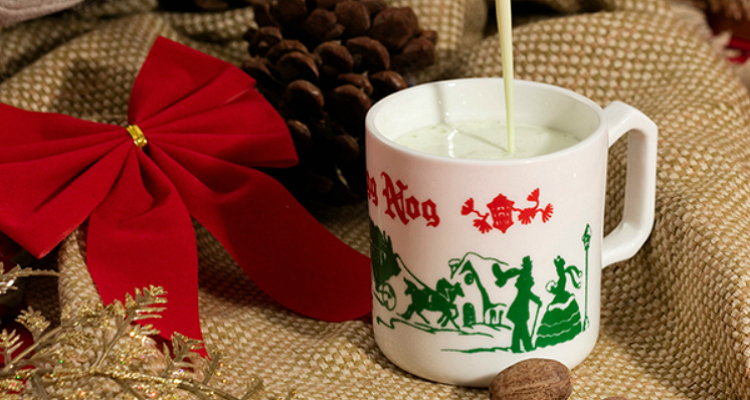 They say Santa likes milk and cookies, but we reckon he's partial to one of these bad boys. Nestled in the heart of Canary Wharf, this sky-high spot offers tasty award-winning food set to London’s iconic skyline. 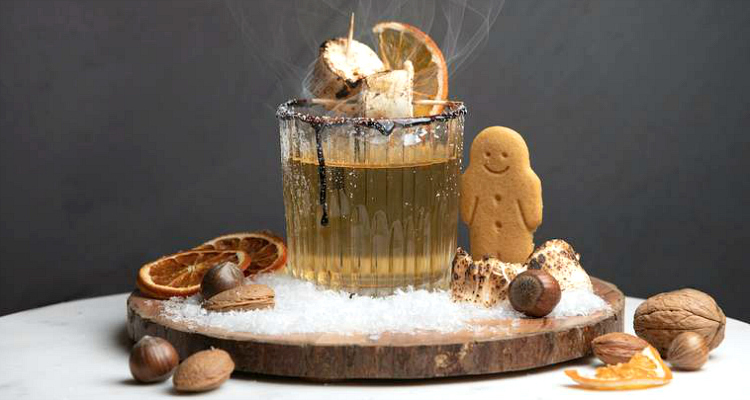 Head 38 floors up for a taste of the Hot Gin and Gingerbread (£9); a warming mix of Sipsmith gin and gingerbread syrup. There’s even a whole host of other wintry serves... 'tis the season to get boozy. Taking you back to winters of your childhood, though this hot serve has a splash of gin. Dust off that cheesy Christmas jumper and get your gift wrap at the ready because Camino’s Bankside outpost has been transformed into the ultimate seasonal retreat and you’re invited. 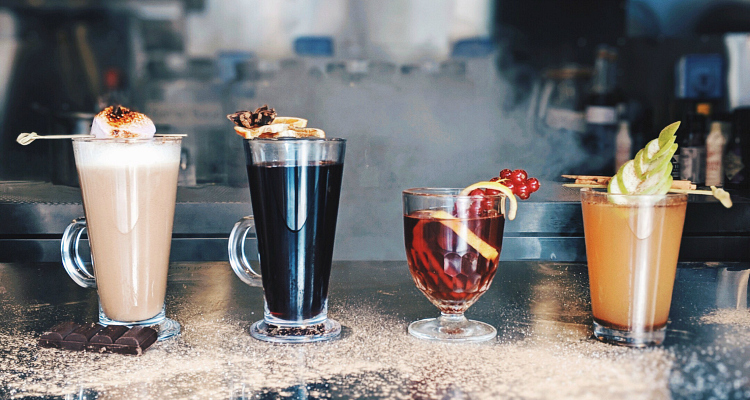 There’s a selection of limited edition bevvies curated by Sipsmith and we’re loving the Mulled Sloe Gin (£8). If that’s not enough to warm your cockles, then a Hot Gin-Gerbread (£8) and Hot G&T (£8) should do the trick. Moved over mulled wine, we're in the mood for the botanical stuff. Can’t bear the hectic queues of Winter Wonderland? Head to Fitzrovia where this swanky punch-centred hotel bar has a special offering of its own, created especially for Hotboozapalooza. Inspired by the Scottish word 'dreich,' meaning dreary, this gin-fuelled Dreich Day Punch (£14) is the perfect pick-me-up to cure those winter blues. Grab a plush seat by the bar and keep 'em coming. Inspired by the back-alley bohemia of Paris’ Montmartre district in the 1900s, Queen of Hoxton’s rooftop pop-up has been given a glitzy makeover. Head up to this Shoreditch space where you’ll find not one or two, but three dessert-themed serves. There’s a Parisian Hot Forest Gateau (£7.50) spiked with cognac or orange liqueur, a Hot Buttered Tarte Tatin Rum (£6.50) and the bourbon-infused A la Mode (£7.50). Things are getting ho-ho-hot at this Shoreditch hangout. The clocks have gone back, the nights are getting colder and you’re gonna need to keep warm. Not content with the old school hot water bottle and layers combo, this Mayfair spot urges you to keep snug with The Wassail (£16). 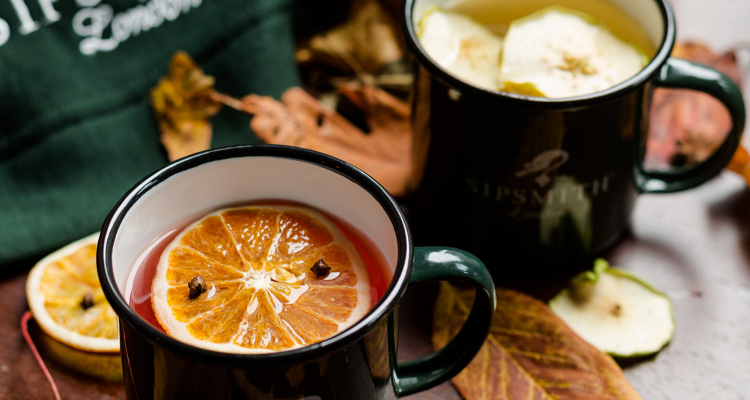 Pairing Remy Martin VSOP with a mulled mix of spices and fruit, it's quite the cosy choice. 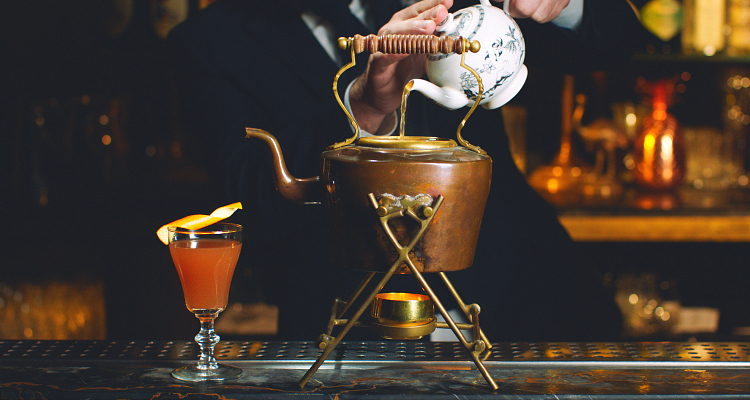 Carolling is so last year, we're all about the wassail. Chocolate smothered s’mores, a snuggly fire-pit and hot cocktails? Sounds like the elves at London Shuffle Club are at it again. Prepare for a whole load of merrymaking as this unique hotspot shakes up a selection of festive creations. 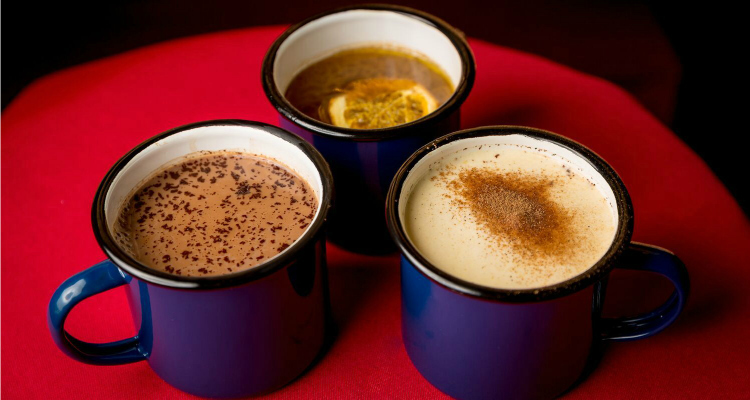 Relax after a game of shuffleboard with one of these cheeky chaps... our personal fave is the Wolf's Tooth (£9); a punchy mix of mezcal, tequila, chilli, oat milk, chocolate and spices (far left). It's the most wonderful time of the year; especially with this lot around. Take the chill off with Sky Pod's slinky little number. Whether you've been naughty or nice, this Sweet Temptation (£11.50) is the only present you need. 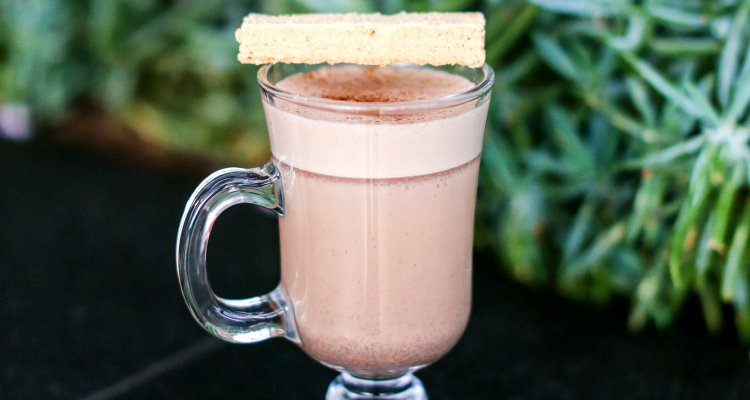 Spiked with Hennessy, amaretto and cinnamon, this isn't the hot chocolate that you're used to. It’s a Christmas miracle. Give into temptation... you know you want to. Always one for an eye-catching concoction, Oriole doesn’t do things by halves. City slickers and east London dwellers should head here for impressive drinks with a soundtrack of live music. 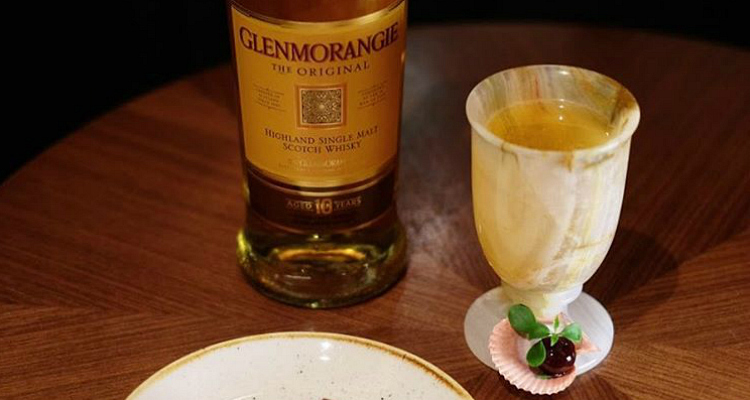 This season, it’s all about the traditional tipples here, with this Glenmorangie-infused Hot Toddy (£8). Whether you’re a real Grinch or a sucker for all things Chrimbo, you’ll love it. Hunker down with this serious sip. But wait—there’s myrrh. For more inspo on what to do this month, check out our extensive guide to winter in London.